Born in 1681, Georg Philip Telemann would inevitably suffer from comparisons with one of the towering figures of western Classical music, born just four years later: Johann Sebastian Bach. Although after his death Telemann may have been constantly cast into the Leipzig composer�s shadow, during his lifetime he was exalted as Bach�s equal and was considered one of the greatest German composers of the early 18th century. Certainly, the size of his output compares very favourably with Bach�s - Telemann was also a highly productive composer, writing over 3,000 works during his lifetime (although not all have survived). 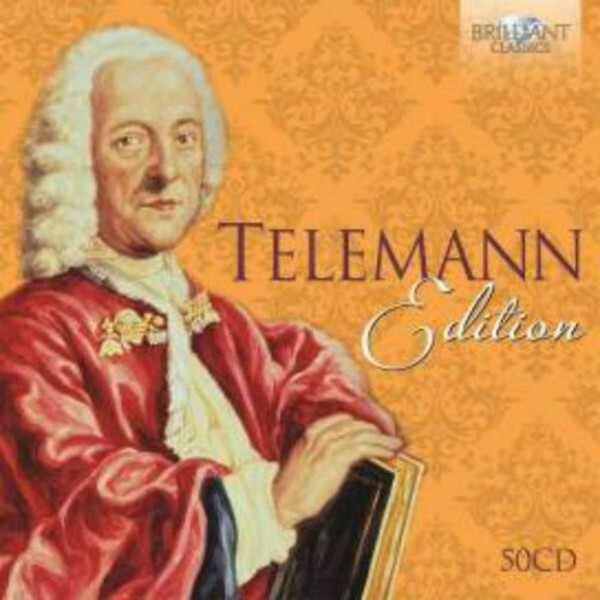 Despite his popularity falling away in the 19th century, today Telemann is almost as highly regarded as he was in his own lifetime - the large number of new recordings on this edition pays tribute to the flurry of interest that has grown around the composer Telemann over the past 30 years. Telemann continued to compose up to his death in 1767. Many obituaries mourned his passing, but one simply stated that �his name is his eulogy� � such was the composer�s status at the time. Although scholars have attempted to categorise Telemann as a Baroque or early Classical composer, in truth he was sensitive to all styles of the time: every musical innovation of the early 18th century is represented in his works. His highly diverse oeuvre is therefore a pleasure to discover, and these recordings span the entirety of his industrious output. Brilliant Classics is proud to offer this new release to add to its growing collection of authoritative composer editions. It represents excellent value for money, featuring renowned Baroque performers, many of whom have already recorded with Brilliant Classics to high acclaim (eg Federico Guglielmo, Roberto Loreggian, Jed Wentz, Peter Schreier, Klaus Mertens, Musica Amphion with Pieter-Jan Belder, Collegium Instrumentale Brugense with Patrick Peire, Ensemble Cordia with Stefano Veggetti, Musica ad Rhenum...). This edition contains hours of listening pleasure representing the most comprehensive selection of Telemann�s music ever released in one set.